Looking for a comforting, healthy lunch – packed full of plant-based protein and vitamins? 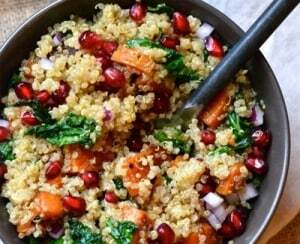 Try this vegetarian Warm Quinoa, Sweet Potato & Kale Salad tossed with a refreshing orange vinaigrette. If you don’t have cooked quinoa, start with that. Place quinoa in a fine-mesh strainer and rinse thoroughly with cool water for at least 2 minutes. Drain. Rinsing quinoa before cooking will remove its natural bitter or soapy taste. Transfer to a saucepan, cover with stock, cover with a lid and bring to a boil. Reduce heat and cook for 15 minutes on the lowest setting. Turn off the heat and let stand covered for 5 minutes. Fluff with a fork and set aside. (This will make a little bit more cooked quinoa than what you will need for the salad). Heat olive oil in a non-stick skillet. Add sweet potatoes and paprika. Season with sea salt and freshly cracked pepper, to taste. Stir to cover the sweet potatoes with the spice. Cook on medium heat until brown on the outside and soft on the inside, about 10 minutes. When they are almost ready, stir in maple syrup and finish cooking.